Criminalize Conservatism: The Worst Conservative Crimes? To isolate just two of the many crimes of the Conservative cartel, voter suppression and economic war, which is the most criminal? 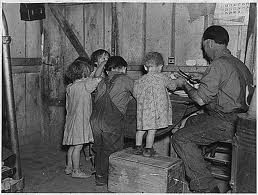 "Christmas Dinner With His Children In Iowa During The Great Depression." Think Progress, in an essay titled, "5 Ways Republicans Have Sabotaged Job Growth," said, "Republican intransigence on economic policy has been a key contributor to the sluggish recovery. As early as 2009, Republican fear-mongering over spending and their readiness to filibuster in the Senate helped convince the White House economic team that an $800 billion stimulus was the most they could hope to get through Congress. Reporting has since revealed that the team thought the country actually needed a stimulus on the order of $1.2 to $1.8 trillion. The economy’s path over the next three years proved them right. 1. Filibustering The American Jobs Act. 3. Threatening A Debt Default. 4. Cutting Discretionary Spending In The Debt Ceiling Deal. 5. Cutting Discretionary Spending In The Budget Deal. Think Progress concluded: "There have also been a few near-misses, in which the GOP almost prevented help from coming to the economy. The Republicans in the House delayed a transportation bill that saved as many as 1.9 million jobs. House Committees run by the GOP have passed proposals aimed at cutting billions from food stamps, and the party has repeatedly threatened to kill extensions of unemployment insurance and cuts to the payroll tax. The New York Times, in an editorial last year, (http://www.nytimes.com/2011/10/10/opinion/the-myth-of-voter-fraud.html?_r=3noted): "It has been a record year for new legislation designed to make it harder for Democrats to vote — 19 laws and two executive actions in 14 states dominated by Republicans, according to a new study by the Brennan Center for Justice. (http://www.brennancenter.org/content/resource/voting_law_changes_in_2012) As a result, more than five million eligible voters will have a harder time participating in the 2012 election. "Of course the Republicans passing these laws never acknowledge their real purpose, which is to turn away from the polls people who are more likely to vote Democratic, particularly the young, the poor, the elderly and minorities. 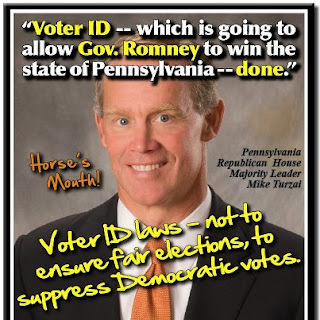 They insist that laws requiring government identification cards to vote are only to protect the sanctity of the ballot from unscrupulous voters. Cutting back on early voting, which has been popular among working people who often cannot afford to take off from their jobs on Election Day, will save money, they claim. "None of these explanations are true. There is almost no voting fraud in America. And none of the lawmakers who claim there is have ever been able to document any but the most isolated cases. The only reason Republicans are passing these laws is to give themselves a political edge by suppressing Democratic votes. "The most widespread hurdle has been the demand for photo identification at the polls, a departure from the longstanding practice of using voters’ signatures or household identification like a utility bill. Seven states this year have passed laws requiring strict photo ID to vote, and similar measures were introduced in 27 other states. More than 21 million citizens — 11 percent of the population — do not have government ID cards. Many of them are poor, or elderly, or black and Hispanic and could have a hard time navigating the bureaucracy to get a card." Just recently the Pennsylvania House Majority Leader, Mike Turzai, said to great to applause at a Republican State Committee bash, "Voter ID, which is going to allow Governor Romney to win the state of Pennsylvania, done." Coupled with the spectre of the voter machine hacking of 2004, President Obama will have to win by 15 points to "officially" win by one point in Pennsylvania. The question at the beginning of this post, "To isolate two of the many crimes of the Conservative cartel, voter suppression and economic war, which is the most criminal," is of course unanswerable: both are heinous, both threaten to send us back to the days of the Great Depression, and both serve to prove the "vast right wing criminal conspiracy." A Postscript:Of the first 122 page views of Criminalize Conservatism, Google Analytics came up with some surprising information showing the country of origination in the "sources of viewers." While a little over three-quarters of the page views came from the U.S., thirteen percent came from the Ukraine! The remaining countries, in order, were France, Canada, Germany, Chile, Portugal, and Russia. He who cannot learn to love must only flatter.